SEAN SPICER HAS said there is a difference between Irish immigrants and people from countries like Mexico entering the US. Since being elected, the US President has pursued plans to build a wall along the US-Mexico border. “You’re equating a wall with not having immigration. Look, every country has to protect its borders and to make sure the people that are coming in are there for purpose of good, that aren’t there to harm their people,” Spicer said. Obviously I don’t agree with the comments that were made on the tape, I don’t think anybody did. And I think the president, at that time the candidate, said that was not a conversation that he approved of, he apologised for it. Spicer said Trump had “expressed remorse” and deserved forgiveness. Spicer quit his job as press secretary last July in opposition to Trump hiring Wall Street financier Anthony Scaramucci as the White House communications director (Scaramucci himself was fired 10 days later after a profanity-laden interview in which he criticised some of his colleagues was published). Speaking about his brief tenure in the White House, Spicer said: “Every day was an eternity. It’s a very demanding job and it’s a very intense place to work, under any president. And with this president you added an element of excitement to each and every one of those days. 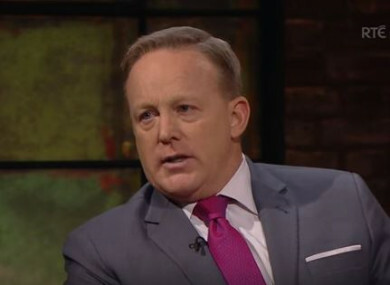 In a separate interview with the Irish Times World View podcast, Spicer said Michael Wolff’s book Fire and Fury: Inside the Trump White House was “between 30 and 40% accurate”. The book paints the White House in a state of disarray, accusing Trump of being unfit to lead a country – something the US President has denied, saying he is a “very stable genius”. The book also quotes Trump’s former Chief Strategist Steve Bannon as describing a meeting between Trump’s son Don Jr and a Russian lawyer during the 2016 presidential election campaign as “treasonous” and “unpatriotic”. During the podcast, Spicer said he believes Trump will be elected for a second term because the US economy is doing well. Email “Sean Spicer says 'there's a difference' between Irish and Mexican immigrants coming to US ”. Feedback on “Sean Spicer says 'there's a difference' between Irish and Mexican immigrants coming to US ”.